Facilitating small group discussions on a certain subject matter can be a fruitful undertaking. Small group gatherings wherein individuals partaking in such are able to express their thoughts and opinions can be intimate and ultimately life-changing, especially if the topics talked about are spiritual and inspiring in nature. It is a fact that healthy discourse between friends and even strangers create new connections and strengthen bonds.If you have recently facilitated a small group gathering and want to know if the occasion had an impact on its participants, obtaining feedback may be a good idea. 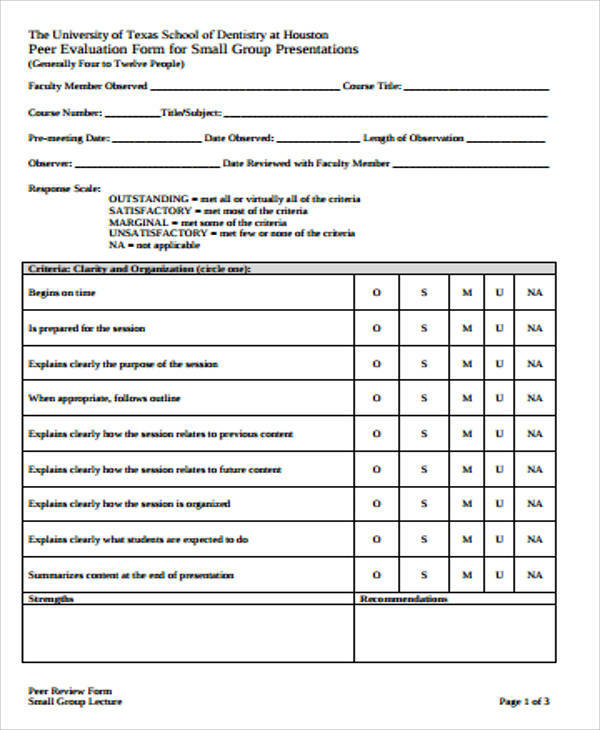 You can create your own evaluation forms using the Sample Forms provided on this page. 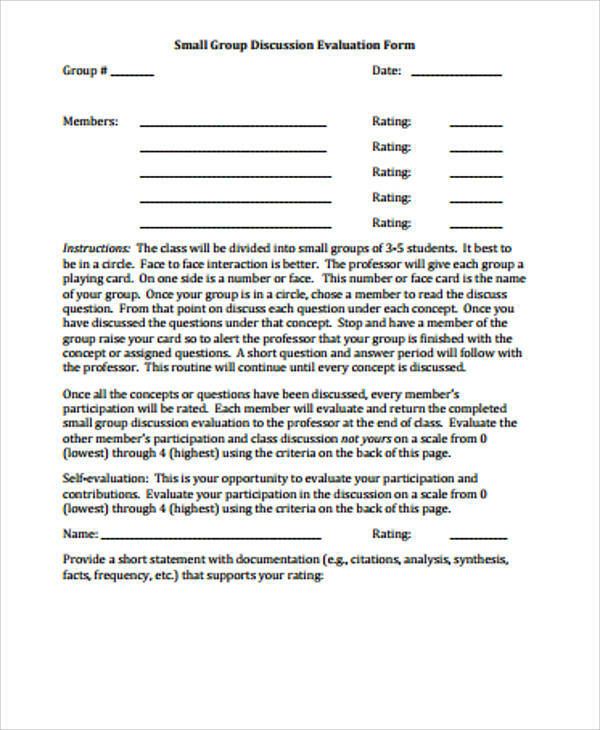 Gathering feedback from your participants can be done simply by making evaluation forms. It is through the distribution of such tools that you will know whether or not the function you facilitated was effective. 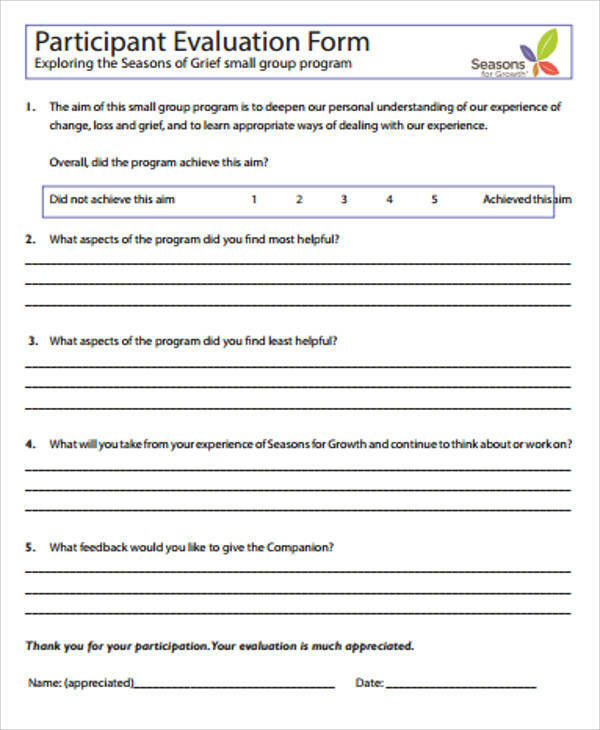 For your evaluation forms to be effective, it is a must that you know the specific components of such documents.The first part of a small group evaluation form is the title of the topic that was discussed during the gathering. Though you can indicate it on the printout yourself, you can also opt to just let the participants provide such information instead. 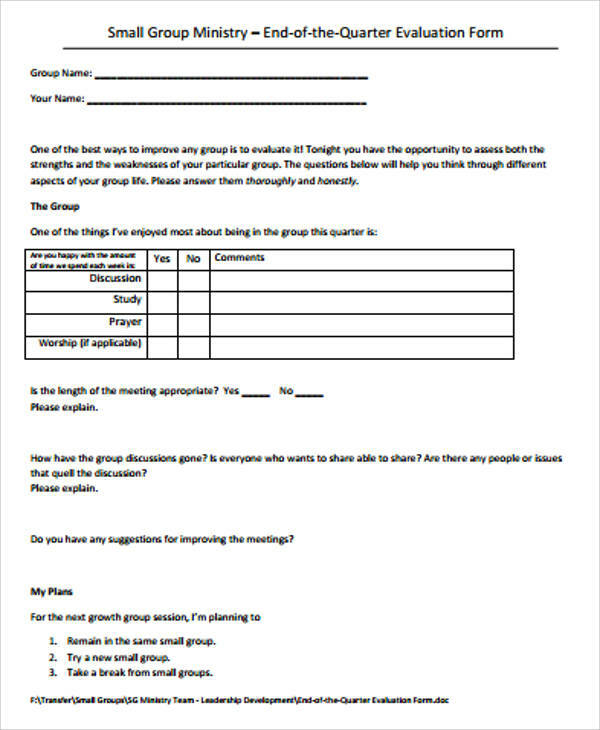 Other parts include the date when the small group discussion took place, the venue of the discussion, and then the name of the person who facilitated it. 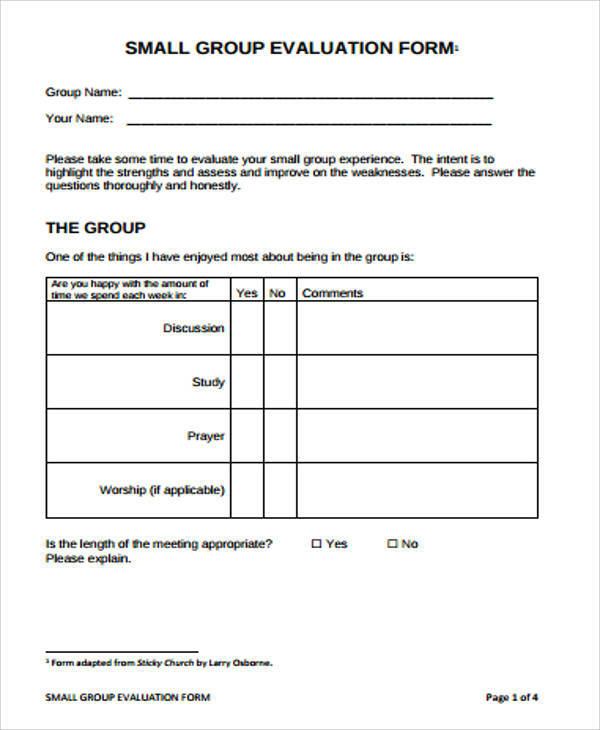 Along with the small group evaluation, you may also produce and distribute Peer Evaluation Forms to the participants of your gathering. Doing this will enable them to provide and feedback on each other. 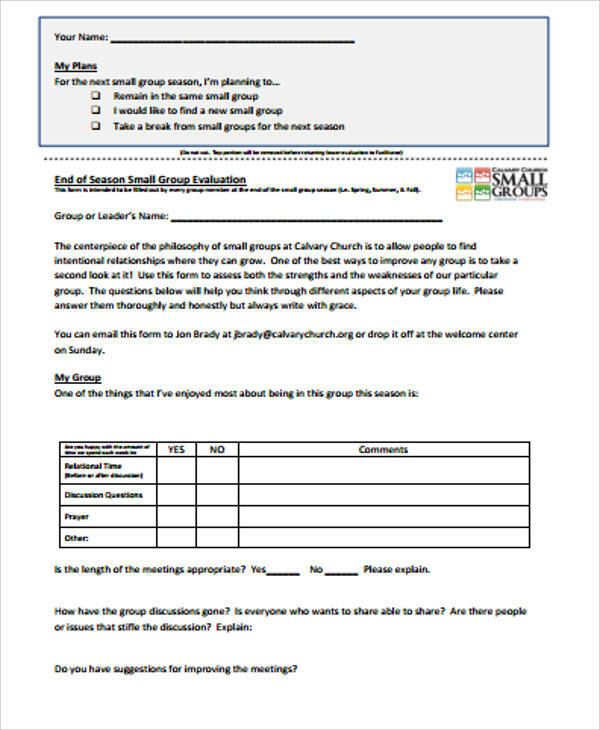 Utilizing Group Self Evaluation Forms has its benefits. Apart from you knowing if the function you facilitated was effective, there are certain advantages that will prove beneficial to you as the facilitator, as well as to your participants. It saves time. 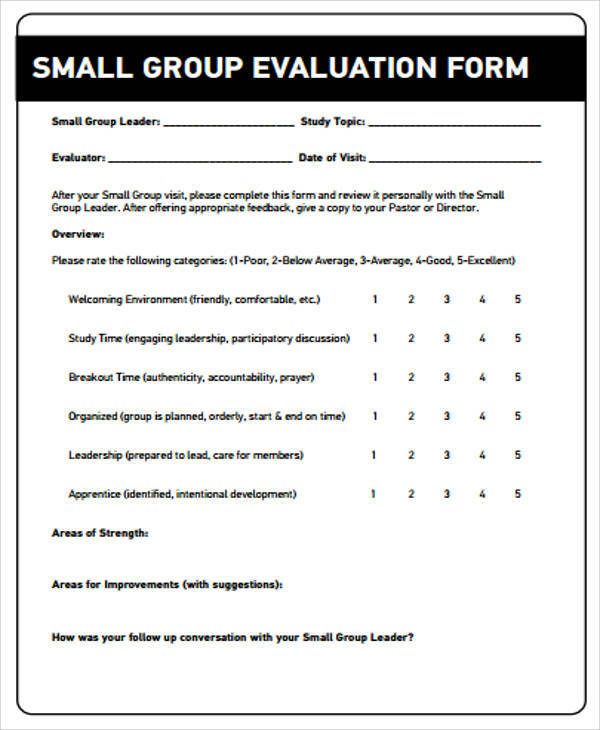 When the participants of your small group discussion evaluate themselves and each other, you no longer have to do any evaluating. Feedback from their point of view will prove more than sufficient. Areas for improvement are efficiently identified. In relation to the first benefit mentioned, obtaining feedback from your participants means pointing out the areas for improvement. You will be able to find out both the strengths and weaknesses of your function in a timely manner. Participants are able to make suggestions. Other than identifying the areas for improvement, participants can also make suggestions through the evaluation forms you provide them. Not only will you know what to improve, but you will learn ways on how you can implement or apply such improvements to your next function. Participants can learn from each other’s successes. Through group evaluations or peer assessments, the participants will be able to learn from one another. One will know how another overcame a particular hindrance and vice versa. It will become a healthy cycle of feedback-exchanging and storytelling.